COLLEGE STATION, Texas — The No. 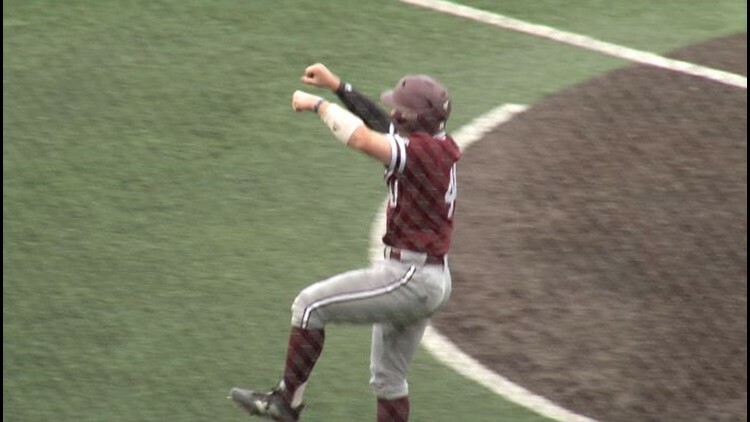 9 Texas A&M Aggies start the most road-heavy portion of their schedule as the Maroon & White head to Schroeder Park to play the Houston Cougars Tuesday evening. Game time is slated for 6:30 p.m. The Aggies play eight of their next nine games away from Olsen Field at Blue Bell Park, including SEC series at South Carolina and No. 17 Ole Miss and midweek games at Houston and Sam Houston State. After five weeks of conference action, the Aggies (9-5-1 SEC) are just a half-game behind first-place Georgia (10-5) and Mississippi State (10-5) in the league standings. The Texas A&M pitching staff is on pace to set a school record for strikeouts in 2019. With 424 strikeouts through 38 games, the Maroon & White are on pace to hang 625 Ks through the 56-game regular-season schedule. The school record for strikeouts in a season is 612 set by the 2010 squad, the only season the Aggies have ever reached the 600-K mark. The Aggies rank in the top 20 in the nation in numerous pitching categories, including strikeouts per nine innings (2nd - 11.1), K-to-BB ratio (2nd - 3.89), WHIP (9th - 1.13), ERA (7th - 2.88), shutouts (7th - 5), walks allowed per nine innings (10th - 2.85) and hits allowed per nine innings (15th - 7.35). Individually, Asa Lacy ranks sixth in the nation in strikeouts per nine innings (14.01), seventh in strikeouts (83), 15th in hits allowed per nine innings (5.06) and 32nd in ERA (1.69). John Doxakis ranks 8th in the nation in K-to-BB ratio (9.00), 15th in walks allowed per nine innings (0.93) and 35th in ERA (1. 76). Kasey Kalich ranks 6th in the nation in saves with ninth. With his next save, Kalich will move into a tie for fifth place on the Texas A&M’s single-season saves chart. He is chasing the school record of 14 set by Jason Jester in 2013 and equaled by Nolan Hoffman in 2018. Braden Shewmake enters the week into ninth place on the Aggies’ career RBI list. With 146 career ribbies, he needs one to tie Chuck Knoblauch for eighth place. Shewmake also moved into a tie for 10th place on Texas A&M’s career triples list with 10. After starting the season 13-13, Houston has won eight of its last 10 contests, including a three-game series sweep at Wichita State over the weekend. The teams met earlier this season at the Shriners Hospitals for Children College Classic at Minute Maid Park with the Aggies logging a 3-2 victory.